This article is about the British Crown dependency. For other uses, see Guernsey (disambiguation). d. The States of Guernsey issue their own sterling coins and banknotes (see Guernsey pound). Guernsey (/ˈɡɜːrnzi/ GURN-zee), officially the Bailiwick of Guernsey (French: Bailliage de Guernesey, IPA: [bajaʒ də ɡɛʁnəzɛ]), is a possession of the British Crown in right of Guernsey in the English Channel, off the coast of Normandy. As a bailiwick, Guernsey embraces not only all ten parishes on the island of Guernsey, but also the islands of Alderney and Sark – each with its own parliament – and the smaller islands of Herm, Jethou and Lihou. Although its defence is the responsibility of the United Kingdom, the Bailiwick is not part of the United Kingdom but rather a possession of the British Crown. It lies within the Common Travel Area of the British Isles and is not a member of the European Union, but has a special relationship with it, being treated as part of the European Community for the purposes of free trade in goods. Together, the Bailiwick of Guernsey and Bailiwick of Jersey form the geographical grouping known as the Channel Islands. Around 6000 B.C., rising seas created the English Channel and separated the Norman promontories that became the bailiwicks of Guernsey and Jersey from continental Europe. Neolithic farmers then settled on its coast and built the dolmens and menhirs found in the islands today. By the beginning of the 18th century, Guernsey's residents were starting to settle in North America. The 19th century saw a dramatic increase in prosperity of the island, due to its success in the global maritime trade, and the rise of the stone industry. During World War I, approximately 3,000 island men served in the British Expeditionary Force. Of these, about 1,000 served in the Royal Guernsey Light Infantry regiment formed from the Royal Guernsey Militia in 1916. For most of World War II, the Bailiwick was occupied by German troops. Before the occupation, many Guernsey children had been evacuated to England to live with relatives or strangers during the war. Some children were never reunited with their families. The occupying German forces deported some of the Bailiwick's residents to camps in the southwest of Germany, notably to the Lager Lindele (Lindele Camp) near Biberach an der Riß. Guernsey was very heavily fortified during World War II out of all proportion to the island's strategic value. German defences and alterations remain visible. The deliberative assembly of the States of Guernsey (États de Guernesey) is called the States of Deliberation (États de Délibération) and consists of 45 People's Deputies (reduced to 38 from 2016), elected from multi- or single-member districts every four years. There are also two representatives from Alderney, a semi-autonomous dependency of the Bailiwick, but Sark sends no representative. The Bailiff or Deputy Bailiff preside in the assembly. There are also two non-voting members: H.M. Procureur (Attorney General) and H.M. Comptroller (Solicitor General), both appointed by the Crown and collectively known as the Law Officers of the Crown. The States also make delegated legislation known as 'Ordinances (Ordonnances)' and 'Orders (Ordres)' which do not require the Royal Assent. Commencement orders are usually in the form of Ordinances. The Lieutenant Governor is the representative of The Crown in right of the république of the Bailiwick of Guernsey". The official residence of the Lieutenant Governor is Government House. Since 15 April 2011 the incumbent had been Air Marshal Peter Walker until his death in office on 6 September 2015. The legal system is Guernsey customary derived from Norman French customary law, heavily influenced and overlaid by English common law, justice being administered through a combination of the Magistrates' Court and the Royal Court. Members of Guerney's legal profession are known as Advocates (Avocats), there being no distinction between solicitors and barristers as in England and Wales: Guernsey Advocates fulfil both roles. The Royal Court of Guernsey (Cour Royale de Guernesey) is made up of the Bailiff (Bailli), who presides and determines issues of law, and between twelve and sixteen Jurats (Jurés-Justiciers de la Cour Royale), who determine issues of fact and are elected to office by an electoral college known as the States of Election (États d'Élection). Appeals lie from the Royal Court to the Guernsey Court of Appeal and thereafter to the Judicial Committee of the Privy Council. Several European countries have consulate presence in the island. The French Consulate is based at Victor Hugo's former residence at Hauteville House. The German Honorary Consulate is based at local design and advertising agency Betley Whitehorne Image. At Lua error in Module:Coordinates at line 668: callParserFunction: function "#coordinates" was not found., Alderney, Guernsey, Herm, Sark, and some other smaller islands have a total area of 78 square kilometres (30 sq mi) and a coastline of about 50 kilometres (31 mi). By itself, the island of Guernsey has a total area of 63.4 square kilometres (24.5 sq mi). Guernsey is situated 50 kilometres (31 mi) west of France's Normandy coast and 120 kilometres (75 mi) south of Weymouth, England and lies in the Gulf of St Malo. Lihou, a tidal island, is attached to Guernsey by a causeway at low tide. The terrain is mostly level with low hills in southwest. The southeastern point is Jerbourg Point, used by the Germans during World War II. Elevation varies across the bailiwick from sea level to 114 m (374 ft) at Le Moulin on Sark. The highest point in mainland Guernsey is Hautnez (111 m (364 ft)), in Alderney at Le Rond But (101 m (331 ft)), in Jethou (76 m (249 ft)) and Herm (98 m (322 ft)). Natural resources include cropland. Guernsey contains two main geographical regions, the Haut Pas, a high southern plateau, and the Bas Pas, a low-lying and sandy northern region. In general terms, the Haut Pas is the more rural of the two, while the Bas Pas is more residential and industrialised. There is a large deepwater harbour at St Peter Port. The Casquets, a group of islets, are notable for the lighthouse facility constructed there. Guernsey has a long and complex geological history. The climate is temperate with mild winters and warm sunny summers. The warmest months are July and August, when temperatures are generally around 20 °C (68 °F) with some days occasionally going above 24 °C (75 °F). On average, the coldest month is February with an average weekly mean air temperature of 6 °C (42.8 °F). Average weekly mean air temperature reaches 16 °C (60.8 °F) in August. Snow rarely falls and is unlikely to settle, but is most likely to fall in February. The temperature rarely drops below freezing, although strong wind-chill from Arctic winds can sometimes make it feel like it. The rainiest months are December (average 112 mm (4.4 in)), November (average 104 mm (4.09 in)) and January (average 92 mm (3.62 in)). July is, on average, the sunniest month with 250 hours recorded sunshine; December the least with 58 hours recorded sunshine. 50% of the days are overcast. Guernsey is divided into ten administrative parishes for local government purposes. The smaller islands of Alderney and Sark are not parishes of Guernsey, except for ecclesiastical purposes. Like Guernsey, their Church of England parishes fall under the See of Canterbury (from 2015), previously under the Bishopric of Winchester, and their respective parish churches are Saint Anne and Saint Peter. As with other offshore centres, Guernsey is coming under pressure from bigger nations to change its way of doing business. Guernsey is changing the way its tax system works in order to remain OECD (and EU) compliant. Tax revenues are 18.2% of GDP. From 1 January 2008 it has operated a Zero-Ten corporate tax system where most companies pay 0% corporate tax and a limited number of activities are subject to taxation, including banking activity (taxed at 10%), regulated utilities and income from the sale of land or building (taxed at 20%). As a result, annual accounts showed an overall a fiscal deficit of £24m in 2011, which it aims to eliminate by economic growth and government expenditure restraint. The deficit is currently supported by drawing funds from reserves built up during periods of surplus. At present the island has no national debt. Guernsey also has a thriving non-finance industry. It is home to Specsavers Optical Group, which manages the largest optical chain in the UK and Ireland and also operates in Scandinavia, the Netherlands, Australia, New Zealand, South Africa and Spain. Healthspan also has its headquarters in Guernsey. Guernsey issues its own sterling coinage and banknotes. UK coinage and (English, Scottish and Northern Irish-faced) banknotes also circulate freely and interchangeably. Guernsey Telecoms, which provided telecommunications, was sold by the States to Cable & Wireless plc, rebranded as Sure and was sold to Batelco in April 2013. Newtel was the first alternative telecommunications company on the island providing a range of residential and business telecommunication services as well as high specification data centres. Wave Telecom which became JT, owned by Jersey Telecom, also provides some telecommunications excluding local loop services. Newtel was acquired by Wave Telecom in 2010. Wave Telecom then became Join Together. Both the Guernsey Post postal boxes (since 1969) and the telephone boxes (since 2002) are painted blue, but otherwise are identical to their British counterparts, the red pillar box and red telephone box. In 2009 the telephone boxes at the bus station were painted yellow just like they used to be when Guernsey Telecoms was state-owned. During late 2011, the UK decided to end VAT relief on Channel Islands goods. This is no longer being contested by the Guernsey Government and several private firms. Guernsey now has the official ISO 3166-1 alpha-2 code GG and the official ISO 3166-1 alpha-3 code GGY; market data vendors, such as Reuters, will report products related to Guernsey using the alpha-3 code. In 2013 there were over 31,000 people employed in Guernsey, with 3,000 being self-employed. 2,038 employing businesses of which 20% are in the finance industry. Individuals resident in Guernsey pay income tax at the rate of 20%. Guernsey, with its sandy beaches, cliff walks and sea scapes has been a tourist destination since at least the Victorian days. Guernsey enter Britain in Bloom with St. Martin Parish winning the small town category twice in 2006 and 2011, Herm winning the small coastal resort category in 2002 and 2008 and tourist destination in 2012. Saint Peter Port winning the large coastal category in 2014 and St Peter's winning the small coastal prize in 2015. Ports and harbours exist at St Peter Port and St Sampson. There are two paved airports in the Bailiwick (Guernsey Airport and Alderney Airport), and 3 miles (4.8 km) of railways in Alderney. The States of Guernsey wholly own their own airline, Aurigny Air Services. The decision to purchase the airline was made to protect important airlinks to and from the island and the sale was completed on 15 May 2003. It was announced that the States would sell Aurigny to a rival Channel Islands' airline, Blue Islands, in July 2010, but the talks fell through in September 2010 due to uncertainty as to whether arrival/departure slots at Gatwick Airport could be guaranteed. Guernsey also has a public bus service, operated by CT Plus on behalf of the States of Guernsey Environment Department. The population is 62,948 (Jul 2015 est.). The median age for males is 40 years and for females is 42 years. The population growth rate is 0.775% with 9.62 births/1,000 population, 8 deaths/1,000 population, and annual net migration of 6.07/1,000 population. The life expectancy is 80.1 years for males and 84.5 years for females. The Bailiwick ranked 9th in the world with an average life expectancy of 82.39 years. 1.54 children are born per woman. Ethnic groups consist of British and Norman descent. For immigration and nationality purposes it is UK law, and not Guernsey law, which applies (technically the Immigration Act 1971, extended to Guernsey by Order-in-Council). Guernsey may not apply different immigration controls to the UK and EEA nationals free movement rights to enter, and remain in, the territory of the British Islands (also in Guernsey), although there are de facto restrictions on occupation of housing by everyone. The housing market is split between local market properties and a set number of open market properties. Anyone may live in an open market property, but local market properties can only be lived in by those who qualify – either through being born in Guernsey (to local parents), by obtaining a housing licence, or by virtue of sharing a property with someone who does qualify. Housing licences are for fixed periods, and are usually only valid for 4 years and only as long as the individual remains employed by a specified Guernsey employer. The licence will specify the type of accommodation and be specific to the address the person lives in. There are a number of routes to qualifying as a "local" for housing purposes. Generally, it is sufficient to be born to at least one Guernsey parent and to live in the island for ten years in a twenty-year period. Once "local" status has been achieved it remains in place for life. Even a lengthy period of residence outside Guernsey does not invalidate "local" housing status. The Education Department is part way through a programme of re-building its secondary schools. The Department has completed the building of La Rondin special needs school, the Sixth Form Centre at the Grammar School and the first phase of the new College of Further Education – a performing arts centre. The construction of St. Sampsons High was completed summer 2008 and admitted its first students in September 2008. Post-GCSE students have a choice of transferring to the state run The Grammar School and Sixth Form Centre, or to the independent colleges for academic AS/A Levels/International Baccalureate Diploma Program. They also have the option to study vocational subjects at the island's Guernsey College of Further Education. English is the language in general use by the majority of the population, while Guernésiais, the Norman language of the island, is spoken fluently by only about 2% of the population (according to 2001 census). However, 14% of the population claim some understanding of the language. Sercquais is spoken by a few people on the island of Sark and Auregnais was spoken on the island of Alderney until it became extinct in the early twentieth century. Until the early twentieth century French was the only official language of the Bailiwick, and all deeds for the sale and purchase of real estate in Guernsey were written in French until 1971 . Family and place names reflect this linguistic heritage. George Métivier, considered by some to be the island's national poet, wrote in Guernesiais. The loss of the island's language and the Anglicisation of its culture, which began in the nineteenth century and proceeded inexorably for a century, accelerated sharply when the majority of the island's school children were evacuated to the UK for five years during the German occupation of 1940–1945. George Métivier, considered by some[who?] to be the island's national poet. The greatest novel by a Guernseyman is The Book of Ebenezer Le Page by G. B. Edwards. In addition to being a critically acclaimed work of literature, it contains a wealth of insights into Guernsey life during the twentieth century. In September 2008, a blue plaque was affixed to the house on the Braye Road where Edwards was raised. A more recent novel by Guernseyman Peter Lihou, Rachel's Shoe, describes the period when Guernsey was under German occupation during the Second World War. Guernsey also hosts a breed of goat known as the Golden Guernsey, distinguished by its golden-coloured coat. At the end of World War II, the Golden Guernsey had almost been rendered extinct due to interbreeding on the island. The resurrection of this breed is largely credited to the work of a single woman, Miriam Milbourne. Although no longer considered to be critically endangered, the breed remains on the watchlist of the Rare Breeds Survival Trust. Guernsey participates in the biennial Island Games, which it hosted in 1987 and 2003 at Footes Lane. Guernsey participates in its own right in the Commonwealth Games. In those sporting events where Guernsey does not have international representation, but the British Home Nations are competing separately, highly skilled islanders may choose to compete for any of the Home Nations. There are, however, restrictions on subsequent transfers to represent other Home Nations. The football player Matt Le Tissier, for example, could have played for the Scotland national football team but played for England instead. Football in Guernsey is run by the Guernsey Football Association. The top tier of Guernsey football is the FNB Priaulx League where there are seven teams (Belgrave Wanderers, Northerners, Sylvans, St Martin's, Rovers, Rangers and Vale Recreation). The champions in 2011–12 were Northerners. The second tier is the Jackson League. The third tier, the Railway League, no longer exists. It consisted of three extra teams, the Alderney Nomads, Guernsey Police and Port City. In 2008–2009, there was a split between the two social leagues (Saturday Football League and Sunday Soccer League). However, the Railway League Cup is still contested as the prize for winning the Veterans League, a league consisting of the seven Priaulx League clubs plus Government United and KGV. In the 2011–2012 season, Guernsey Football Club was formed and entered the Combined Counties League Division 1, becoming the first Channel Island club ever to compete in the English leagues. Guernsey became division champions comfortably on 24 March 2012, and won the Combined Counties Premier Challenge Cup on 4 May, beating Colliers Wood United after extra time. 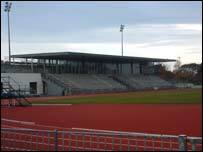 Their second season saw them promoted again on the final day in front of 1,754 'Green Lions' fans, this time to Division One South of the Isthmian League, despite their fixtures being heavily affected not only by poor winter weather, but by their notable progression to the semi-finals of the FA Vase cup competition. Approximately 200 people play table tennis on a regular basis across four senior and two junior leagues. The GTTA centre, located next to the Hougue du Pommier, is equipped with 12 match tables, 6 training tables, a bar and a small café area. Guernsey sends teams to represent the island in UK and world tournaments. The Guernsey Gaels was founded in 1996 and competes in the European Gaelic football leagues. The island hosts its own tournament each year with teams from all over Europe visiting the island. Guernsey also has one of the oldest softball associations in the world. The Guernsey Softball Association was formally established in 1936, it is now one of the oldest and longest running softball associations to be found. Affiliated to the International Softball Federation (ISF) the GSA has both fast and slow pitch leagues with over 300 members. Guernsey also enjoys motor sports. In season, races take place on the sands on Vazon beach on the west coast. Le Val des Terres, a steeply winding road rising south from St Peter Port to Fort George, is often the focus of both local and international hill-climb races. In addition, the 2005, 2006, and 2007 World Touring Car Champion Andy Priaulx is a Guernseyman. Sea angling around Guernsey and the other islands in the Bailiwick from shore or boat is a popular pastime for both locals and visitors with the Bailiwick boasting 12 UK records. ↑ 6.0 6.1 6.2 6.3 Marr, J., The History of Guernsey – the Bailiwick's story, Guernsey Press (2001). ↑ Darryl Mark Ogier, Reformation And Society In Guernsey, Boydell Press, 1997, p.62. ↑ Guernsey's emigrant children. BBC – Legacies. ↑ buses.gg home – buses.gg – the home of Guernsey's bus service. Hctgroup.org. Retrieved on 2013-09-19. ↑ Chaney, Edward, GB Edwards and Ebenezer Le Page, Review of the Guernsey Society, Parts 1–3, 1994–5. ↑ "Golden Guernsey", Rare Breeds Survival Trust. Retrieved 10 October 2007. ↑ Good Food Guernsey – The Ormer, May 2011. This page was last modified on 11 January 2016, at 01:40.